Nick’s Famous Coney Island doesn’t need an introduction and it doesn't need another goodbye (especially since it never closed, which seemed imminent at the time of this post's original writing on the occaison of Frank Nudo's retirment). -Frank Nudo, owner of Nick’s in the Oregon Journal, April 24, 1976. Nick’s is unique: a temple to the Ducks, to the Yankees (it is known by some as “Yankee Stadium West”) and to coney island hot dogs. 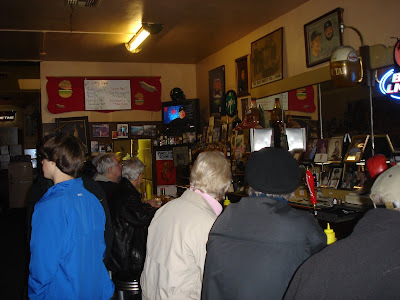 Frank Nudo who has owned it since 1960 holds court daily, giving running commentary on whatever game plays above the bar. It is not a time capsule. There are plenty of anachronisms like the Nike designed U of O football helmet on top of the large color TV, to remind you that it is not 1949 or 1961 or 1972. 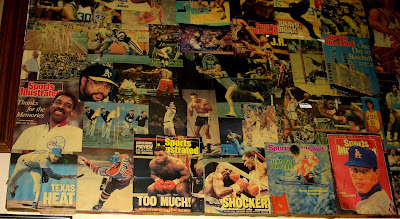 Everything is just right though; the mural of sports illustrated covers, the photographs, the counter, the bar stools. 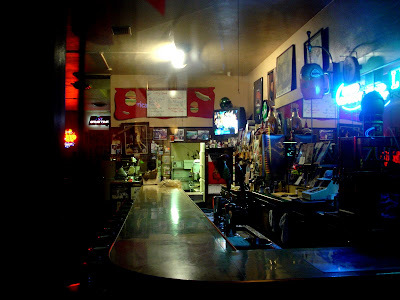 A movie set piece for a production about Mickey Mantle could be more exact but would never capture the soul of Nick's. 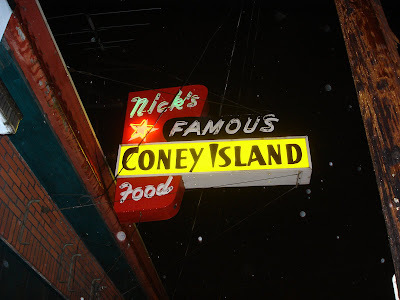 Like Joe Jost’s in Long Beach California or Philippe’s in Los Angeles, Nick’s Famous Coney Island is timeless. Nick Carlacio sold the restaurant to Frank Nudo (with “nothing down”) in 1960. He has ran it ever since. -A regular at the counter, recently overheard. And then there is the food: classic in its simplicity. A damn good coney island. There was Kenny Kell “The Wing Commander,” who passed away last year. There is the memorabilia and the crew (Professionals, one and all). It only begins to describe Nick’s Famous Coney Island, whose intricate recipe is greater than the sum of its parts. 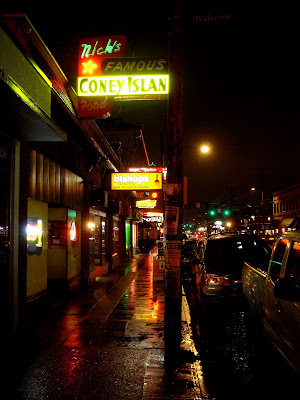 The Portland tradition of eponymous long lived coney island shops stretches far back, even further than Nick’s Famous. In 1921 Greek born Lois J. Gellos moved to Portland and opened “The Coney Island Sandwich Shop” on Washington between Eleventh and Twelfth (the location is now a surface parking lot) across the street from the Portland Telegram Building, then under construction. There he began to serve the popular Midwestern chili dog confection (despite its name, the "coney island" chili dog is not native to New York, where a sparser frankfurter sandwich has reigned supreme since the 1860s). By the later 1920s there were two other locations, one on Sixth and one on Second, but as the as the 1930s began a retrenchment had taken place with only the Washington shop surviving. In 1937, perhaps in reaction to an upstart east-side operation on Hawthorne, the appellation “Original” was added to the restaurant's name. 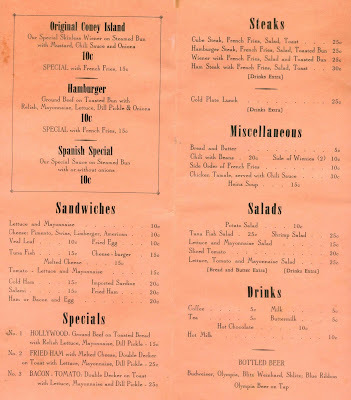 A menu from the “Original Coney Island Sandwich Shop” on Washington near Eleventh. “We Never Close” might indicate a World War II vintage. (Click on images to expand). Coast to Coast at the Original Coney Island Sandwich Shop, from Coney Island to Hollywood. Bottled beers: Blitz Weinhard, Schlitz, Blue Ribbon. Olympia on tap. Louis Gellos died in 1942. His widow, Bertha took over the restaurant. She passed it to her son, Louis Gellos Jr in 1959. The Original Coney Island Sandwich Shop was sold in the late 1960s to a Robert Smith. It closed in 1969. Dominick “Nick” Carlacio 25 years. Louis J Gellos 21 years. Bertha M. Gellos 17 years. Louis J Gellos Jr. 9 years. Godspeed and thank you Frank Nudo. 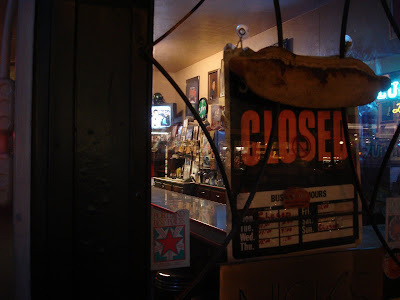 (Note- When this post was written in 2008, the closure of Nick's seemed a done deal. Happily it was not the case and Nick's Famous Coney Island is alive and well, under the loving care of Carrie Hogrefe. This post has minor revisions to reflect this happy turn of events. DH 2015.